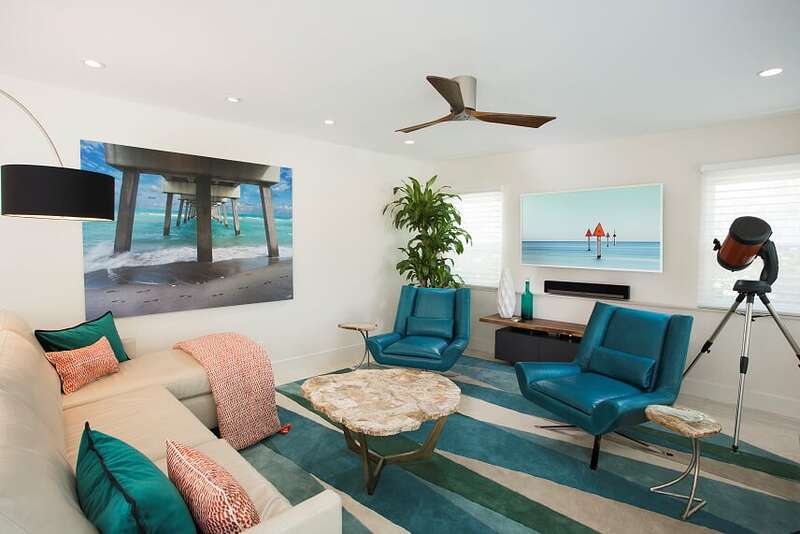 In the summer of 2015 we were invited to help Robert Jensen and Brandon Jones discover their Key West dream home. 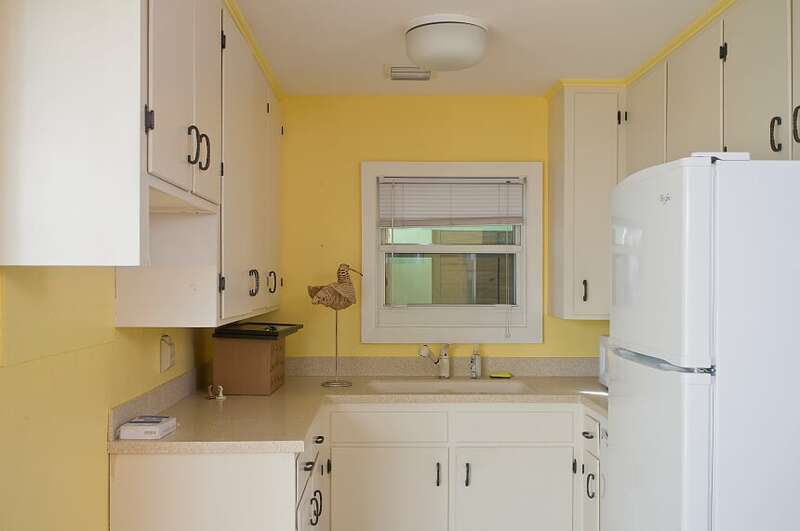 At the end of a productive morning of showings—and with much anticipation—we introduced them to a property a bit outside of their stated parameters. With fingers crossed, we hoped that the unpolished gem that had recently captured our imaginations, would do the same for them. It was love at first sight. 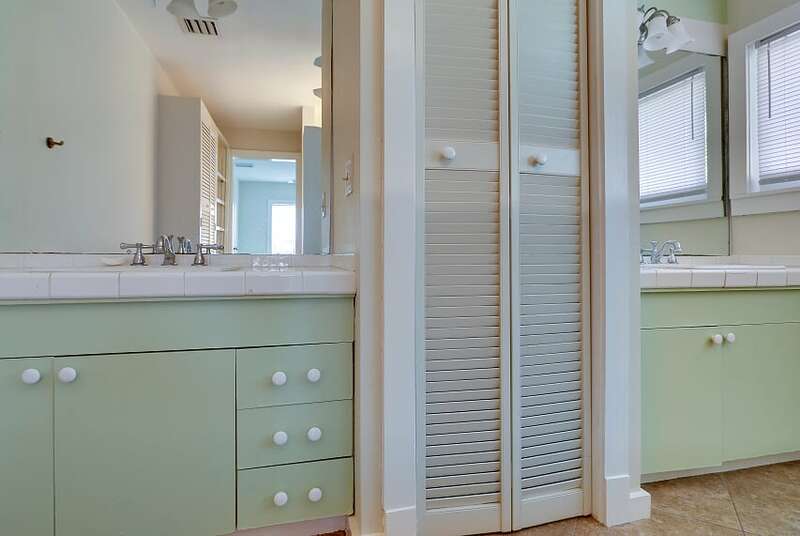 Shortly after closing on the property Brandon and Robert assembled their renovation “A” team and began a two-year recreation of their two bedroom and two bath mid-century home. 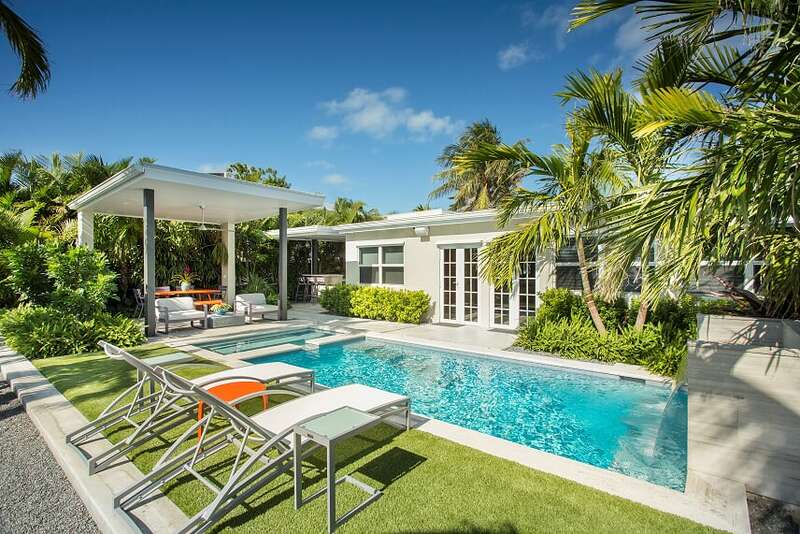 With stunning results, they have polished their Key West diamond in the rough to perfection. 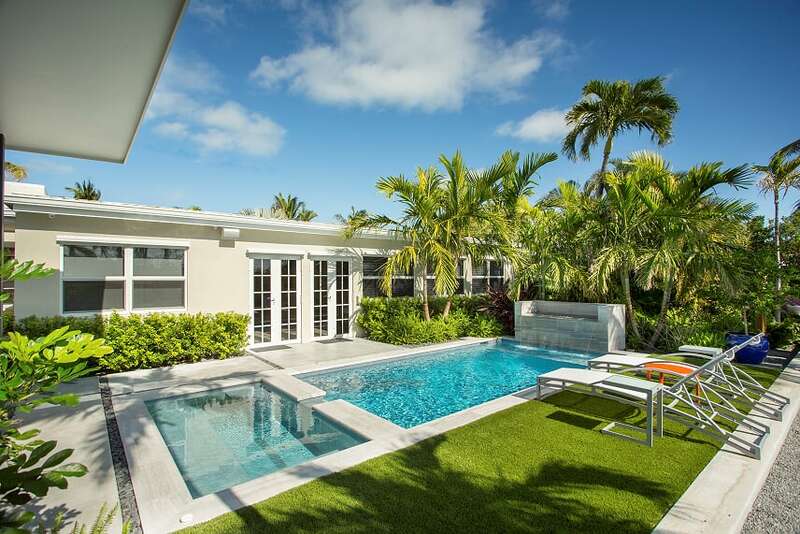 Brandon and Robert feel very lucky to have collaborated on their project with top notch Key West professionals. 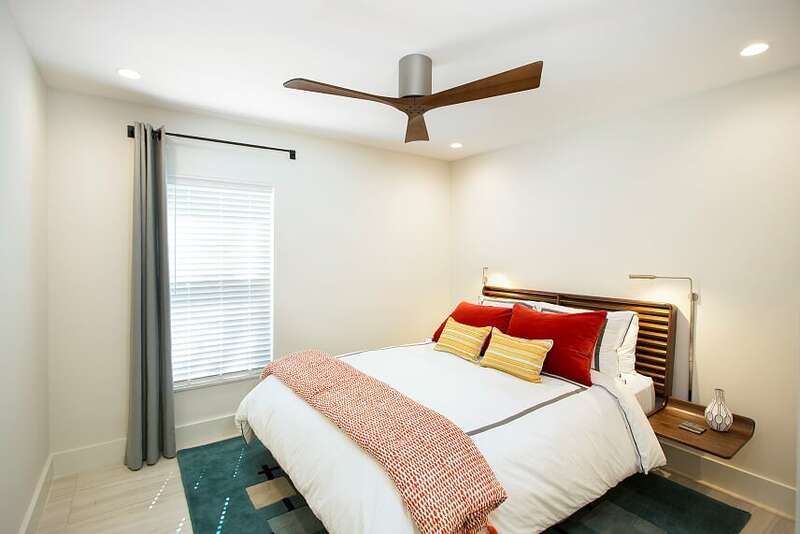 Jordan Holtkamp of Holtkamp Construction did outstanding work as their General Contractor and Rob DeLaune, Architect, brought his skill and talent to the remarkable home transformation. 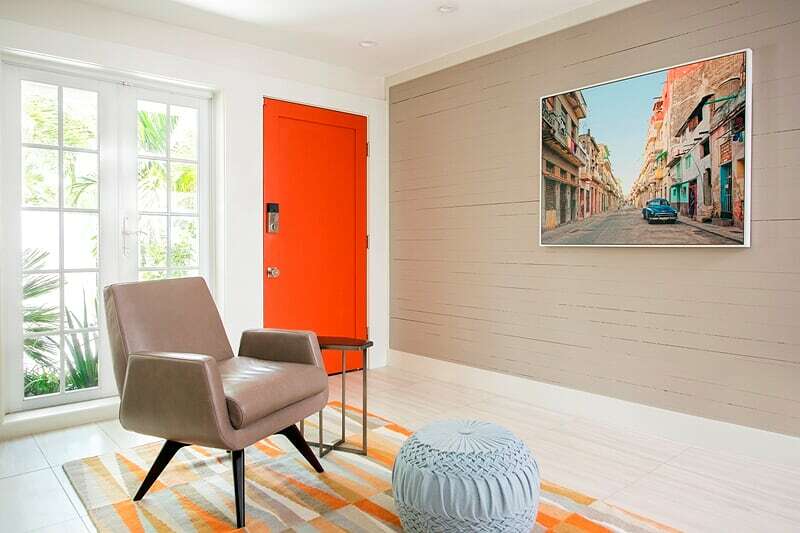 Feeling that Key West is the perfect place to experiment with bold color choices, the owners had the front door painted their favorite shade of orange and carried the color theme throughout. 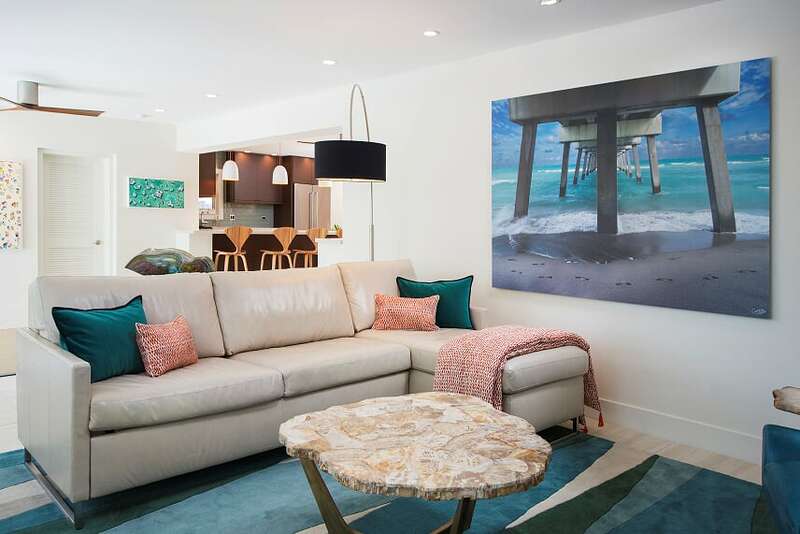 By beautifully combining her creative and artistic expressions with her clients’ personalities, Debra Butler, of Debra Butler Design Studio, fashioned a bright and open modern design for the interior. All the art and accessories were chosen by Robert and Brandon—with each treasure holding a special meaning for them. 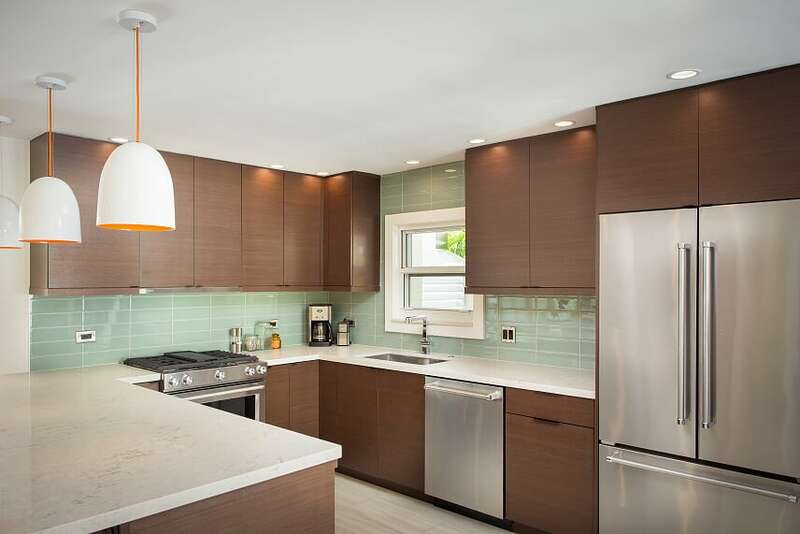 The outdated and tiny original kitchen was reconceived as a sleek and stylish chef’s delight. 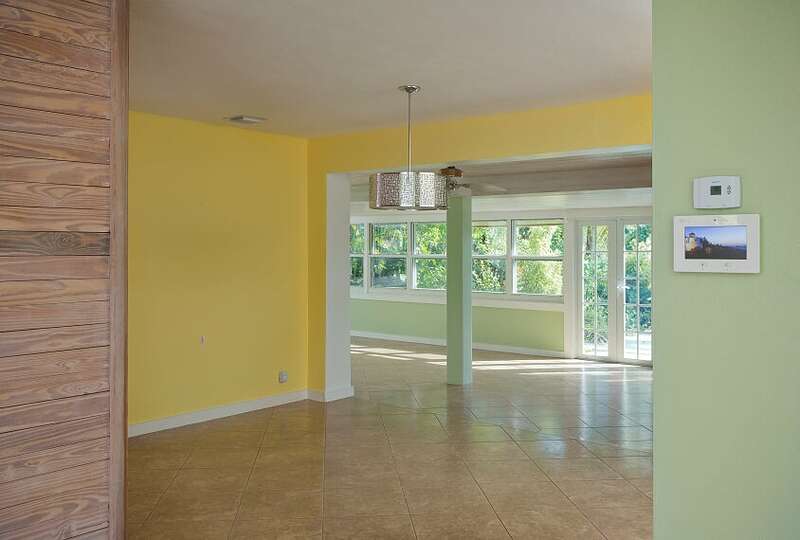 Robert and Brandon love the décor of the Florida room. 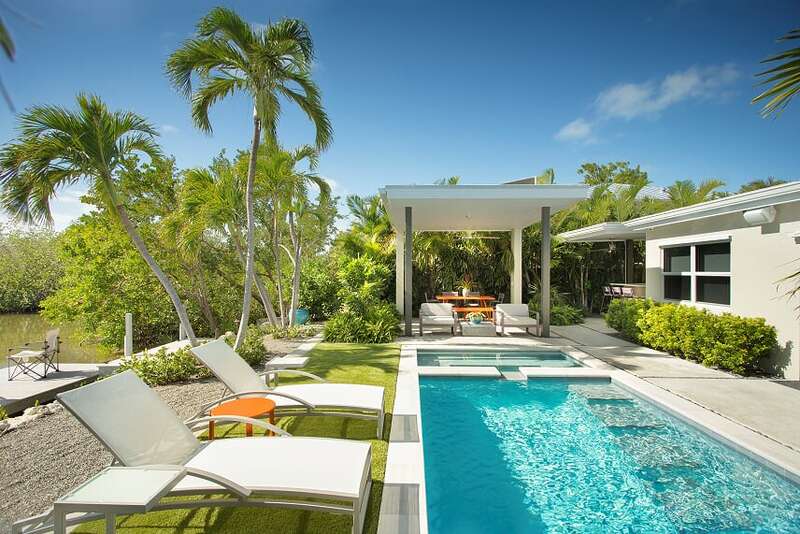 Its varied hues of blues and blue-greens take them to the alluring waters of Key West. 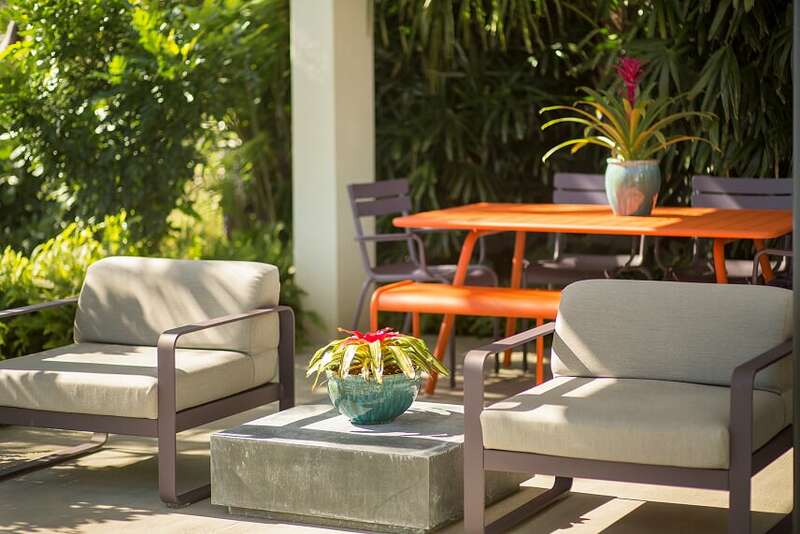 The Luke armchairs in Flagstaff Deep Water, by custom furniture maker American Leather, are special favorites. 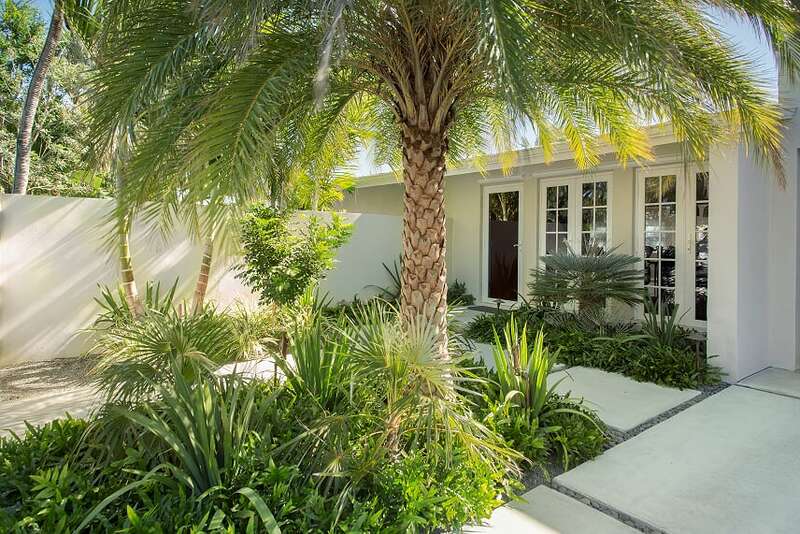 The tranquil master suite opens to an unforgettable private oasis. 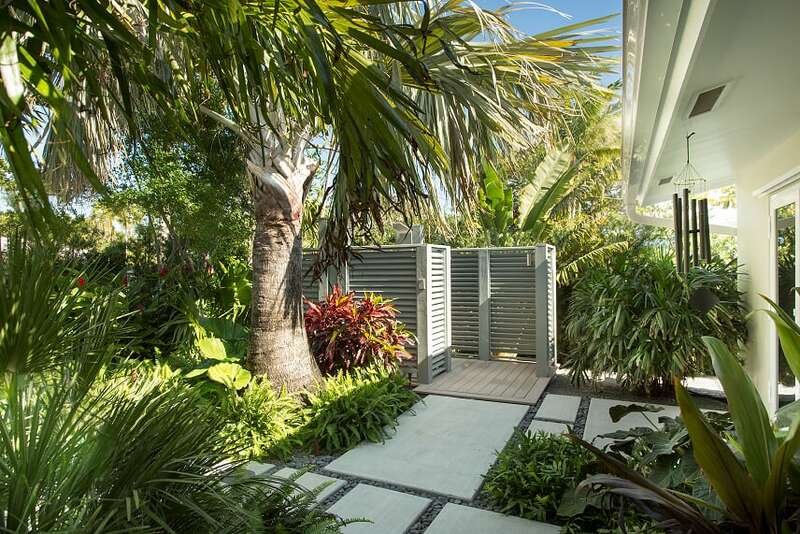 Surrounded by lush tropical landscaping, the serene outdoor shower and intimate seating area provide the perfect setting for surrendering to island life. 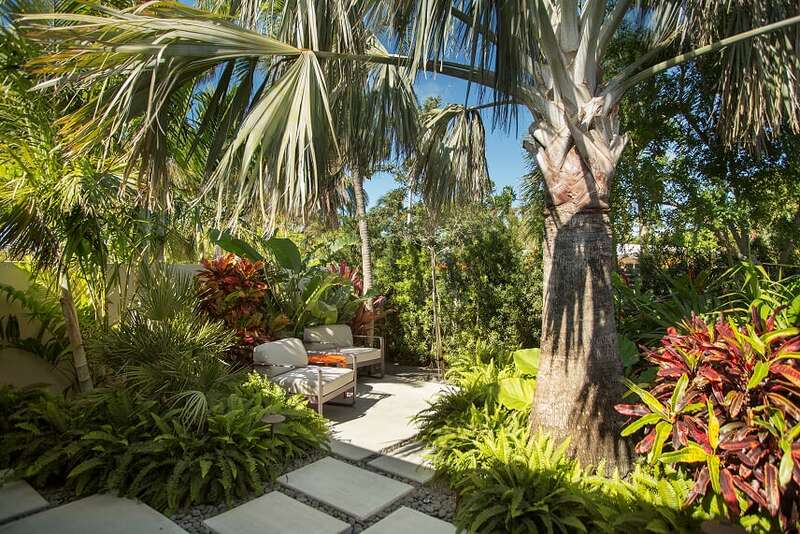 A master of his craft, Mark Harris with Diggin Key West, created the home’s spectacular gardens. 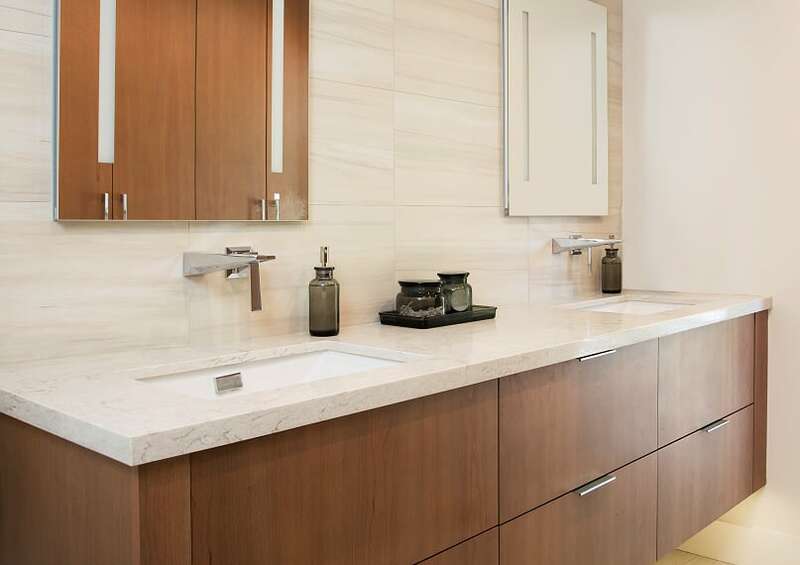 The things about the home that really make the owners happy are the simple architectural and design aspects—even down to the faucets and fixtures chosen for the new bathrooms. 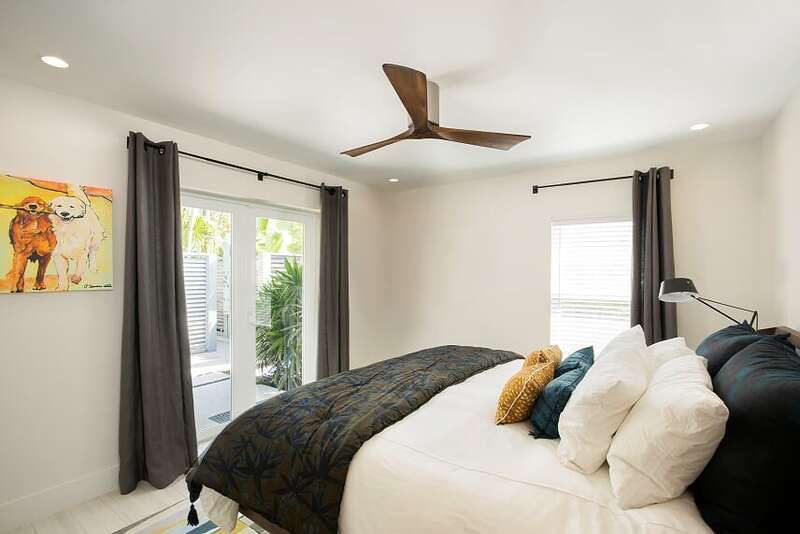 The resort-worthy guest accommodations are a welcomed retreat after a day of sun, sand, and sea. 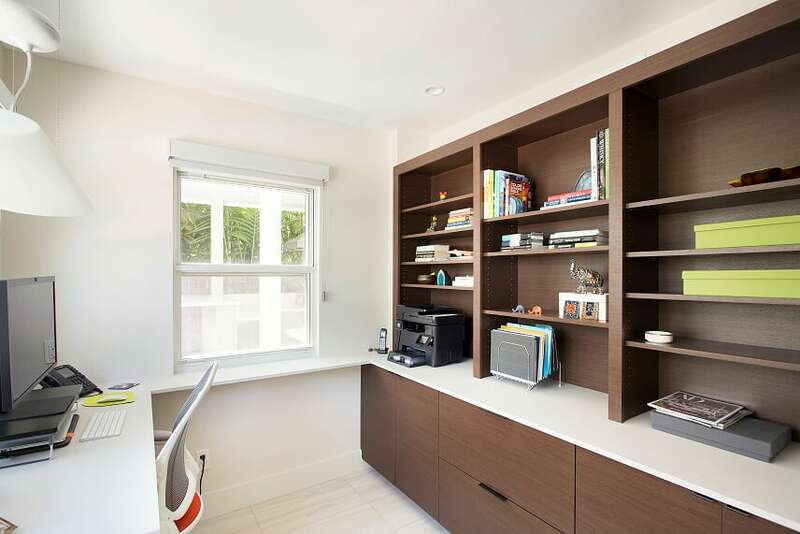 With its peaceful water views, the custom-built office almost makes working from home a treat. 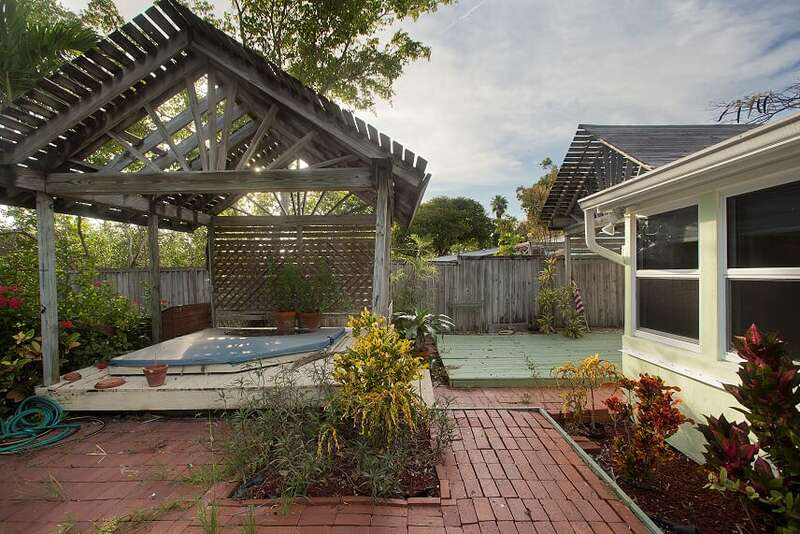 The awe-inspiring transformation of the home’s backyard is undoubtedly the renovation’s crown jewel. 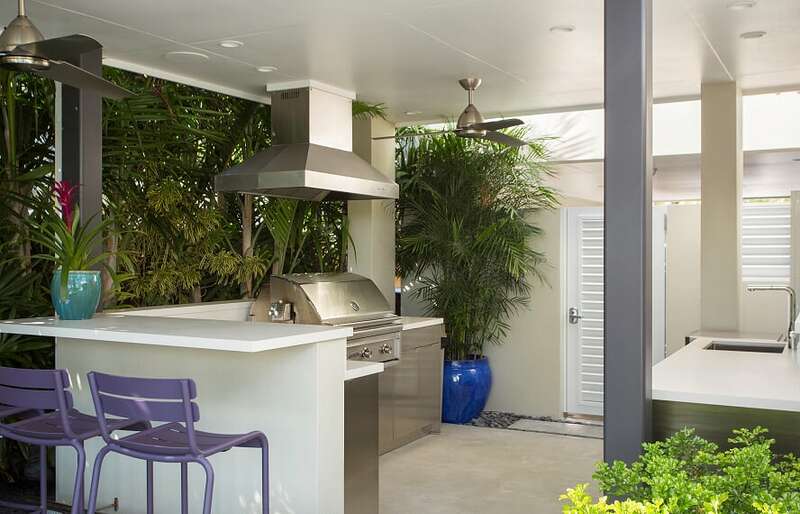 Having a top-of-the-line outdoor kitchen makes hosting friends and family a pleasure. 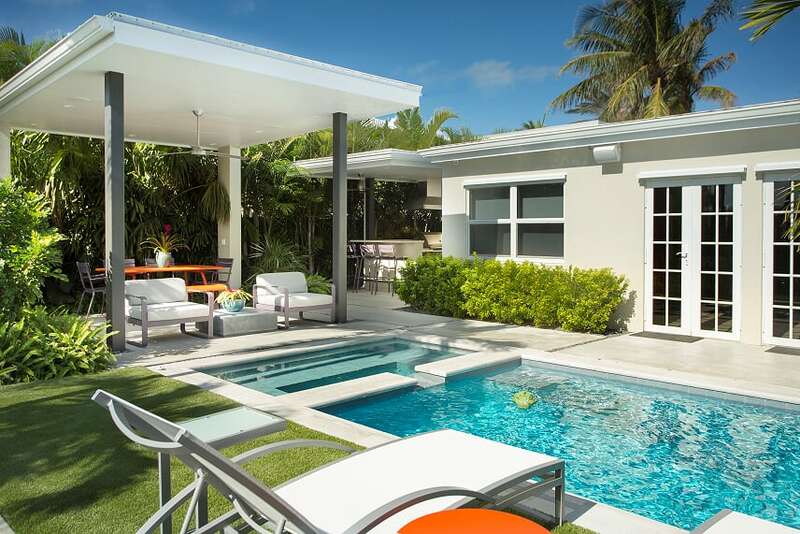 Brandon and Robert’s favorite “room” of the house is the outdoor sitting and dining area beside the pool and ponds. They spend most of their time there, kicking back, watching the water and the visitors it brings. 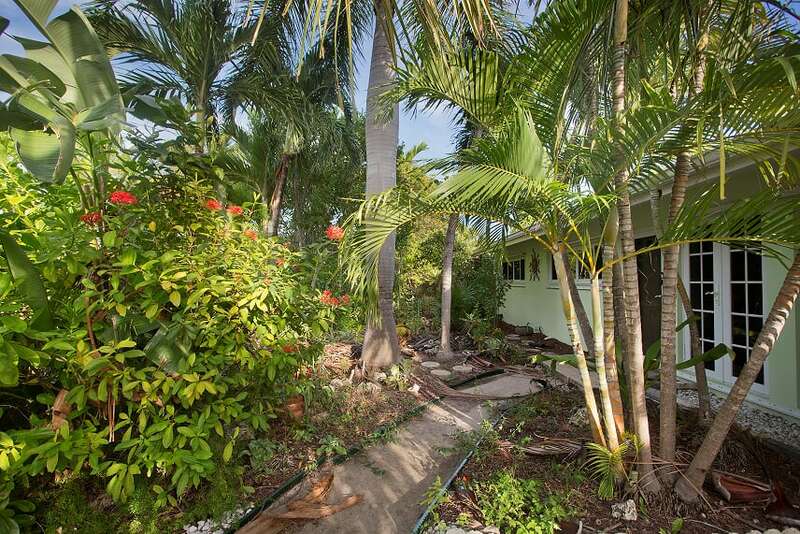 “It’s a great place to entertain, or just soak in paradise without distraction,” Brandon said. 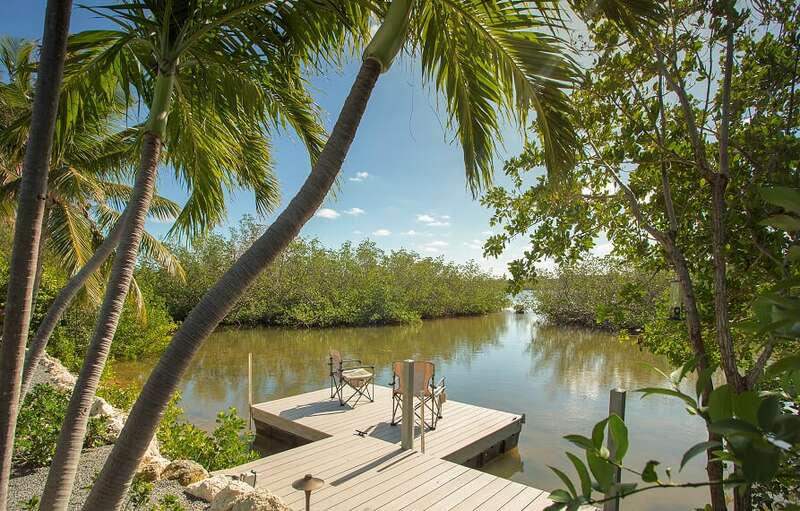 Key West’s salt ponds are a hidden treasure, largely undiscovered by tourists and locals. 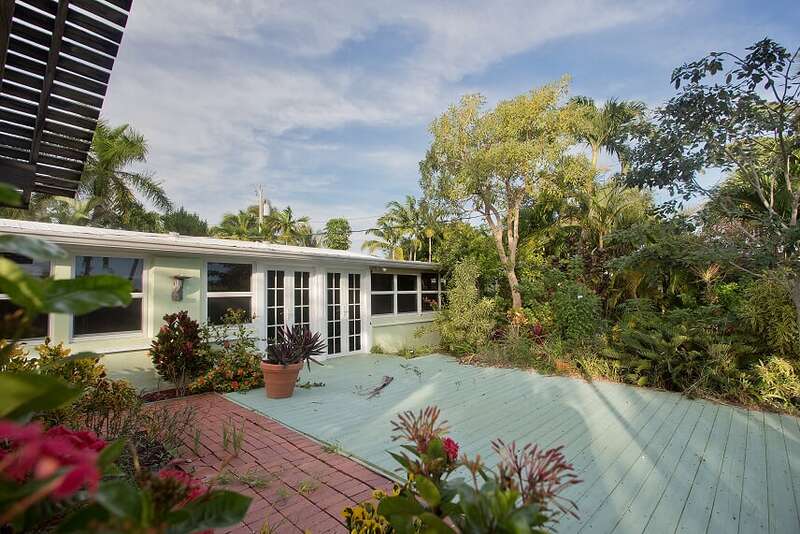 Alive with crabs, shrimp, fish, herons and other birds that visit daily, the engaging ponds at the back of the property have not fallen from the top of the list of reasons why Robert and Brandon purchased the home. 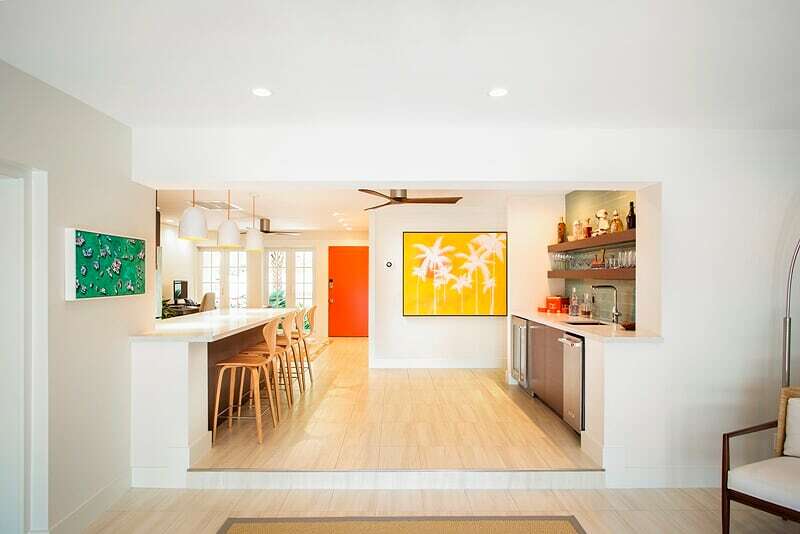 Nothing is more gratifying than seeing friends and clients bring their vision for their new home into reality. 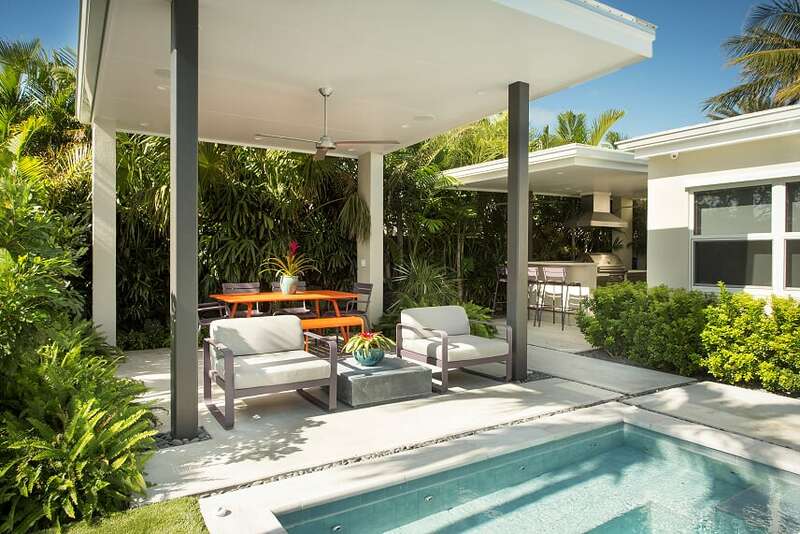 Simply put, Robert Jensen and Brandon Jones have created a Key West dream home to die for. We could not be more delighted for them both. 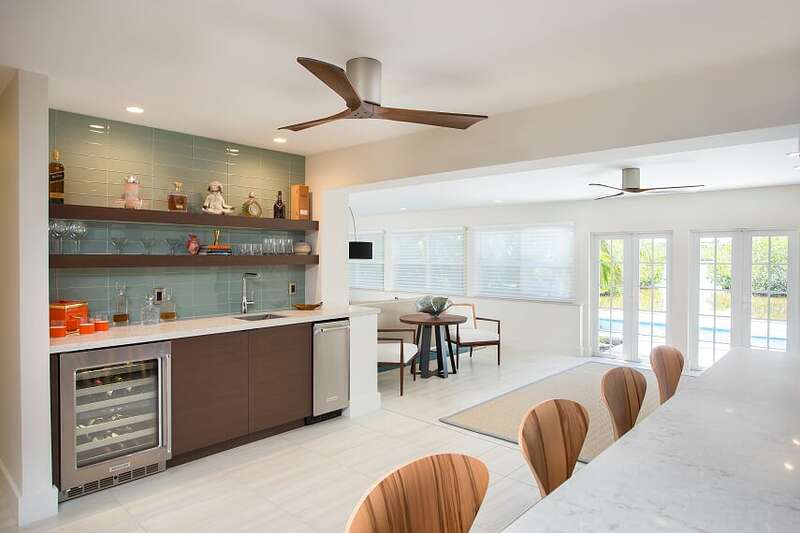 This entry was posted in Before and After Home Renovation, Homes We Love, Key West Real Estate and tagged Before and After Home Renovation, Florida Keys, Key West, Key West Home Renovation, key west real estate, Key West Salt Ponds, Key West Style, pools, real estate, tropical gardens, waterfront on July 28, 2018 by Dean.